Take a beer glass and frost the rim with lime and salt. Squeeze the limes to release the juice into the glass. Next, add the mango juice, chamoy sauce and a small pinch of salt. Pour in the beer and lightly stir with a spoon. Enjoy! 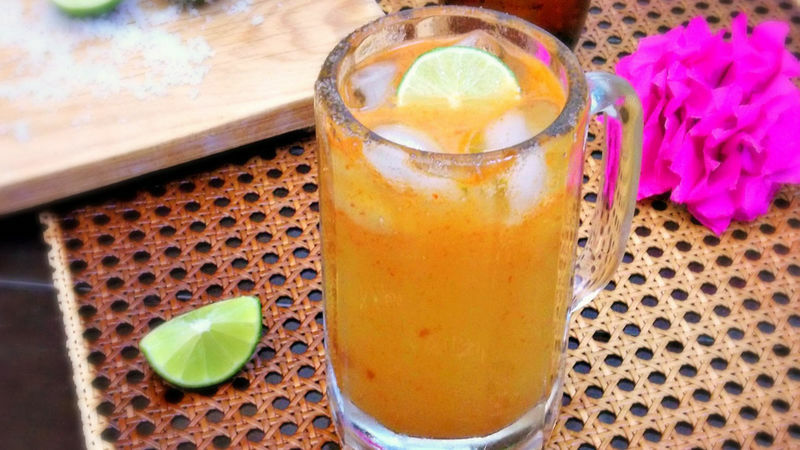 This Michelada can also be prepared with peach or pineapple nectar. The Michelada is a refreshing, cocktail-like drink prepared with beer. The base of any good Michelada also includes salt, lime and a spicy salsa. When I prepare this drink, I use my favorite salsa-Mexican chamoy sauce (which is made with pickled fruit). This salsa is a bit spicy, with a sweet toque added from jam or fruit such as tamarind or apricot. But chamoy sauce isn’t just for Micheladas; it’s used with many appetizers and snacks, like fresh sliced fruit. For me, one of the best combinations is mango with chamoy, whether it be sliced mango, a mango popsicle, or this mango Michelada. Try making this drink at home and discover a new, fun way to enjoy a rica cerveza.